THP has your first look at the new for 2011 Nike VR Pro Cavity iron set. This new set of irons is getting a lot of early attention and THP wanted to showcase some of the hands on pictures before the testing begins. Expanding on the success of the VR franchise, Nike Golf has developed a set of irons that meets the eye of a Tour level athlete while meeting the performance expectations of an aspiring golfer. Nike’s new VR Pro Cavity irons offer more forgiveness, distance, and better ball flight than Tour-level forged irons. The ball flight off the VR Pro Cavity irons is improved due to the Opti-Mass Weighting system. This system is used to get the weight lower, deeper and more centralized, guaranteeing that the center of gravity is in an ideal position for trajectory and distance. The Opti-Mass is an injection-molded blend of polymer and high-density tungsten to create precise weight distribution, while also serving as a dampening tool. The face technology of the VR Pro Cavity irons produce powerful distance while the Opti-Mass weighting system creates predictable distance. Developed by Nike Golf engineers at Nike’s Research and Development (R&D) facility, The Oven, the Nike VR Pro Cavity irons utilize new Linear Center of Gravity (CG) Mapping, which provides maximum power and predictable distance. The CG moves gradually throughout each club in the set for optimal launch and consistent distance control. 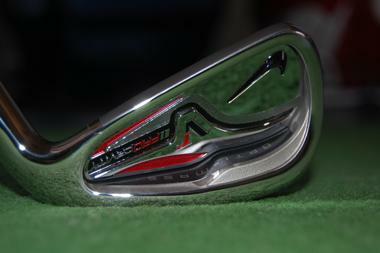 The Nike VR Pro Cavity irons also have a lower and deeper CG than its predecessor, the VR Full Cavity irons. The VR Pro Cavity irons maintain the traditional look of the Tour-level VR Pro Blades and VR Pro Combo irons with added forgiveness. The Pro Combo-inspired progression provides the right club for the right shot with the ideal blend of forgiveness, control and feel. Love the looks. Most anticipated irons for me. May replace the Machspeeds!!! Eager to hear THP’s thoughts. Definitely can’t wait to see these in person. Those are pretty slick. Contest/giveaway for a starving cart attendant? I like my VR Full Cavity irons, and these look another good evolution of Nike’s cavity back club line-up.